It’s time of eating fish again. Yes, we like to have fish twice or three times a week. Let it be steamed, pan-fried or cooked in soup. Salmon fillets are always on my family’s menu as we can gain more omega-3 oil. 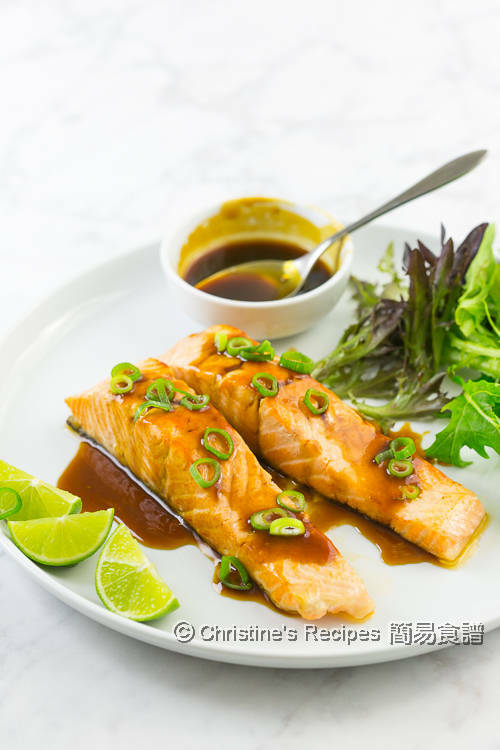 This salmon fillet dish is very easy to make. Just need a few minutes of pan-frying. 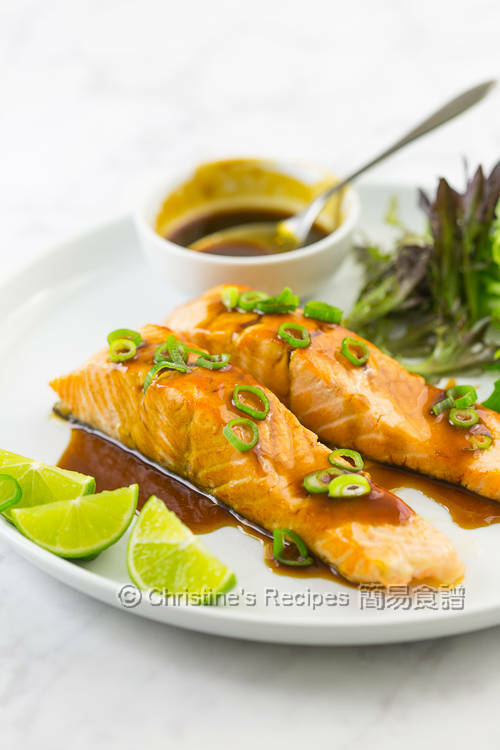 Yet, with the homey, yummy lemongrass ginger soy sauce, the salmon fillets taste even better and moist. The mirin, almost essential in Japanese cooking, and the lemongrass, very common in Thai cruise, are working together to make a fusion-like dish. On top of that, the fragrance of lemongrass really takes the whole dish up a level. It’s not an ordinary pan-fried salmon dish any more. Rinse the salmon and wipe dry with kitchen towels. Remove any bones if any. Season with salt and pepper. Trim away the green part of the lemongrass. Pound the white part with the back of a cleaver or a knife. Finely chop. Set aside. Heat oil in a skillet over medium heat. Place the salmon in the pan with skin side first. Cook until both sides are lightly brown, until your preferred doneness. Dish up. Cover to keep warm. In the same skillet, add a little more oil. Saute the lemongrass, garlic and ginger. Pour in the sauce. Add the chilli. Bring it to boil. Reduce it by 1/3. Stir in the thickening. Cook to your preferred consistency. Drain through a sieve to remove the lemongrass and chilli. Ladle over the salmon fillets. Garnish with spring onion. Serve immediately. 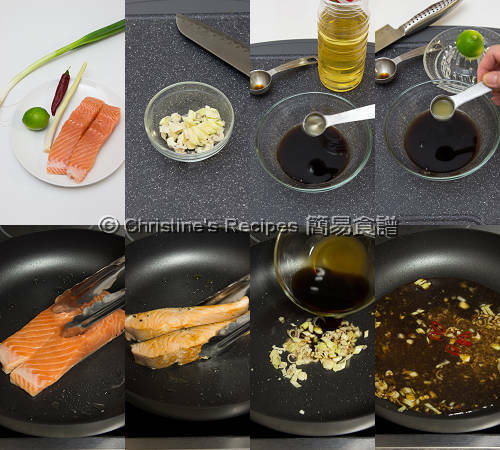 While pan-frying salmon, you don’t need to add too much oil as the fish will release some oil. Salmon fillets will curl up a bit once they heat up. You might use a spatula or tong to press the fish meat lightly. Quickly the meat will flatten after a short while. The remaining lime juice can be served with the dish. No need to waste it. My favourite fish! The sauce sounds really flavoursome and perfect with any fish!